Sailing/farming/action-RPG Rune Factory: Tides of Destiny is coming to North America on both the Wii and PS3. One of the most heftily played RPGs on the Wii was Rune Factory: Frontier, Neverland's first console version of the DS Rune Factory series. The sequel, announced in Japan as Rune Factory: Oceans, will attempt to give Frontier a run for its money, as Natsume has confirmed that it'll publish the game as Rune Factory: Tides of Destiny in North America for both the Wii and PlayStation 3. Rune Factory is a spin-off of the Harvest Moon franchise, known for bringing players through the trials and tribulations of a young farmer. Rune Factory adds some excitement through a real-time combat system and dungeon crawling, forcing players to both cut down goblins and ensure they don't let their squash crops rot. In addition, Tides of Destiny stacks on a new element: sailing. Sort of. Instead of remaining land-locked as in Frontier, players will ride on the back of a giant named Ymir through the game's vast oceans. As you seek out hidden islands and dungeons, you'll also have to deal with massive enemy sea creatures. And make sure you don't forget about that squash. The game's storyline follows two lifelong friends, a male and female named Aden and Sonja, that wake up one day to find both of their souls are trapped in the same body. Their home has also been replaced by a strange island populated by strange people. They have to figure out what the heck is going on while... yeah... the squash. 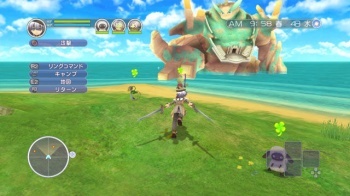 Rune Factory is notable for the large amount of freedom and activities it gives players. They can take down monsters and collect loot from dungeons, go fishing, attempt to seduce mates, craft all sorts of different weapons and items, and more. Tides of Destiny marks the first time the series has hit the PlayStation 3. Natsume will show the game off in action at E3 2011, scheduled for June 7-9.